Yes, we are a day early. Thanksgiving isn't until tomorrow. But, as Harold and I will be too busy first filling ourselves with turkey, and stuffing, and rolls, and potatoes, and green bean casserole, and deviled eggs, and pumpkin pie, and then laying about comatose after having ingested loads of turkey, and stuffing, and rolls, and potatoes, and green bean casserole, and deviled eggs, and pumpkin pie; we thought we would post our Thanksgiving strip today, and then close for the holiday. 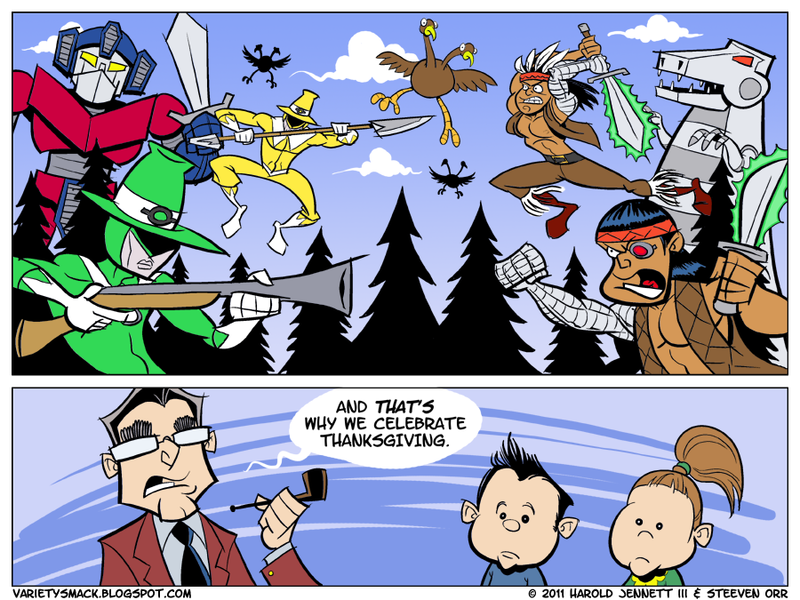 This strip is actually 6 years old and tells the true story behind Thanksgiving. It was created for our first web comic, Variety Smack, which we then turned into Our Adventure Continues. So happy Thanksgiving, everyone. While there are days in which I feel like I don't have a lot to be thankful for, I only need to think about my family and friends and I feel like a rich man.